Divorce is tragically common across the globe, with Australia boasting depressingly high divorce rates. Before you give up hope, consider the benefits of couples counselling. Think your marriage isn’t in trouble? You, too, might benefit from couples counselling, since some of the biggest harbingers of divorce have nothing whatsoever to do with how frequently you fight or happy you are with your relationship. 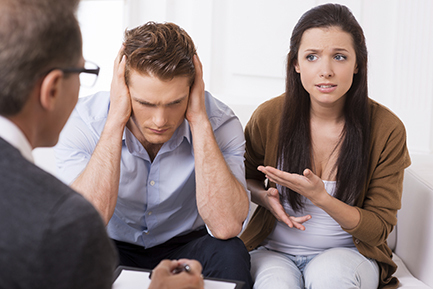 If you experience any of these five symptoms of a troubled marriage, counselling with Three Seas can help you get back on track. We’ll teach you the communication and relationship skills you need to sustain a happy marriage for a lifetime. We’re the impartial voice to your marriage, the conscience that will tell you when you’re doing it wrong, and your one-stop shop for a blissful, sustainable marriage. Some conflicts define a marriage. Every married couple, no matter how happy or successful, has a few problems they’ll struggle with forever. Often these issues stem from deep incompatibilities. Maybe you’re an extrovert, while your spouse prefers the comforts of home. You’re not going to convince her to go out partying every night, and she’s not going to convince you of the benefits of relaxing at home. Conflict is the inevitable result, but it doesn’t have to be. Whether the fight is one you’ve had for 20 years, or something that’s just now reared its ugly head, we can help you find solutions to problems that seem unsolvable. By understanding each other’s perspectives and better addressing your own needs, you can steadily reduce conflict while building intimacy. Believe it or not, it’s common for one or both spouses to experience times during which they do not feel loved. We all have different needs. Whether your spouse doesn’t know how to meet yours or is deliberately being cruel, we can help you get things back on track. We’ll show you how to identify and express your needs, then help both you and your spouse more competently show each other love and affection. If somethings holding one of you back from behaving in a loving manner, we’ll get to the heart of the matter. Centuries ago, marriage only needed to last a few years because humans averaged pretty short life spans. Now, couples are looking at 40, 50, 60, and even 70 years together. It’s hard to sustain love for a lifetime, no matter how wonderful your spouse is or how deeply in love you were when you first met. Love isn’t an emotion, though; it’s a skill. Early in your relationship, it’s easy to do things that cultivate love, but as life and time interfere, sustaining love becomes more challenging. Rest assured, no matter how distant or resentful you feel right now, we can help you build lasting love. Let us show you how to bring back the romance and butterflies, so you can get to enjoying what really matters all over again. The overwhelming majority of couples who experience infidelity will need counselling to recover. The good news is that more than half of couples eventually cover from this painful betrayal. We can help with more than just infidelity, though. A host of bad habits—compulsive spending, gambling, alcoholism, drug addiction, aggression, anger, flirting with others, and neglecting household or financial responsibilities—can all lead to the downfall of your marriage. If you’re tired of stewing over your partner’s shortcomings, let us show you how to move beyond them. No person is perfect, but even the most flawed among us can have excellent marriages—if you’re willing to put in the effort. All too often, we hear from clients whose spouses are unwilling to pursue counselling. But don’t give up just yet. A partner’s unwillingness to consider therapy is inevitably a sure sign that yo need therapy! It may be that your partner just feels too sad, overwhelmed, or misunderstood to believe that therapy can help. We routinely offer marriage counselling to just one side of the marital equation, and we can do this with you, too. You may be surprised to see how quickly things change, even when only one partner is willing to seek therapy. In many cases, the reluctant partner ultimately comes around after he or she sees how much counselling is helping. Don’t let your marriage spiral out of control. Even the best marriages require some work, and the occasional tune-up. Let us help you get things back on track.